Aurifil Thread, from Milan Italy, started out as cotton machine embroidery thread, but quilters quickly discovered that Aurifil Mako Cotton Thread was ideal for piecing and quilting. We carry Aurifil Mako Cotton thread in 4 weights, and also sell Aurifil Lana Wool Thread and Aurifil Bobbin Thread. Which weight of Aurifil Mako Cotton Thread should I choose? A higher thread weight indicates a finer (thinner) thread. Finer thread will emphasize your fabric choices and quilt design. The most popular weight of Aurifil Thread is their finest, 50 weight thread. The traditional choice for quilting is 40 weight cotton thread. 40 weight is also the most popular weight for machine embroidery. A heavier weight thread will emphasize the quality of your stitches. 28 weight mako cotton quilting thread will showcase your quilting stitches. Aurifil also manufactures a 12 weight Mako Cotton Thread that is ideally suited for redwork and serging. 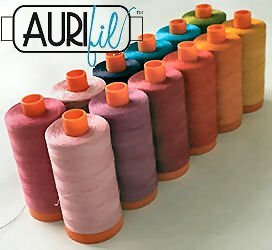 Aurifil manufactures an 80 weight Cotton Thread that is great for English Paper Piecing, Hand Applique, Machine Embroidery, Machine Applique, Free Motion uilting, and Free Motion Couching. Aurifil Longarm Polyester 40wt Variegated Thread is the new MUST HAVE variegated polyester thread. It is a 40wt high sheen premium trilobal polyester thread, ideal for embroidery, quilting, thread painting and decorative stitching. Aurifil 12wt Lana Wool Thread is a textured thread made of half Australian Wool and half Acrylic. This unique thread gives a soft finish to the woollen fabrics and is ideal for folk art applique designs.